This season, prints are having a moment. Like thats anything new, right? Prints are always having a moment! So what's the big deal about 2012 prints? What makes them different from the prints of previous seasons? For starters, fashion designers and style setters are throwing caution to the wind and taking some major style risk and pairing up their fave prints together. And not the simple granden variety kind. They are bringing out the big guns. From tried and tested floral, stripes and polkas to season favorites- aztec, batik, and even Van Gogh's 'Starry Night', the print trend is everyones fave mixing bowl. Spotted at Salvatore Ferragamo, Proenza Schouler, Rag & Bone, Prada, Diane von Furstenberg, Dries Van Noten to name a few. This trend has also been making its presences felt in the editorial pages as well as the fashion blogosphere. The key feature of this trend is to look like an artful collage and not a circus act. While mixing prints keep these few styling points in mind. 1.There must always be a sequence as to how the items are paired. Your mixes should match as well. Random pairing is a big no-no. 3.Lastly, never ever wear a print head to toe. 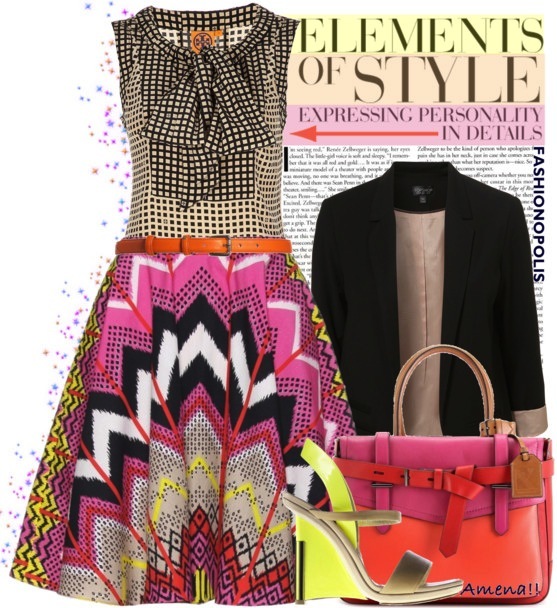 Throw in a basic neutral item to break up the prints, especially if you’re wearing bright and bold all over patterns. 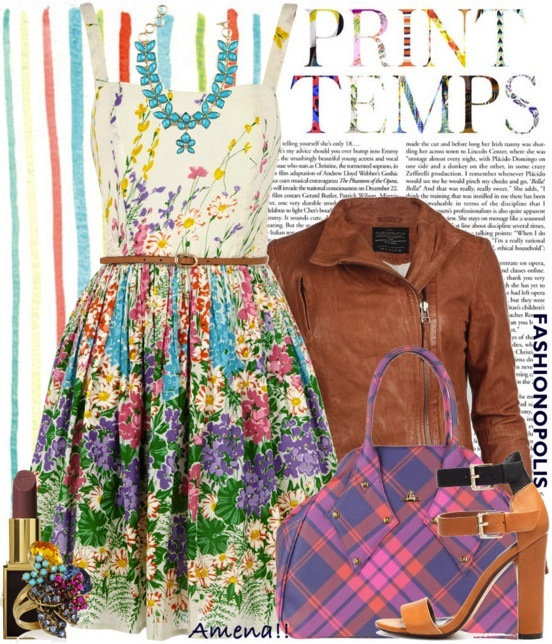 With unlimited mixing options, here are some of my suggestions to styling 2012's IT print trend. Mix I: COLOURFUL FLORAL+TARTAN CHECKS. Mix II: WILD FLOWERS+MISSONI STRIPES. Mix III: GRAPHIC SQUARE DOTS+IKAT PRINT. 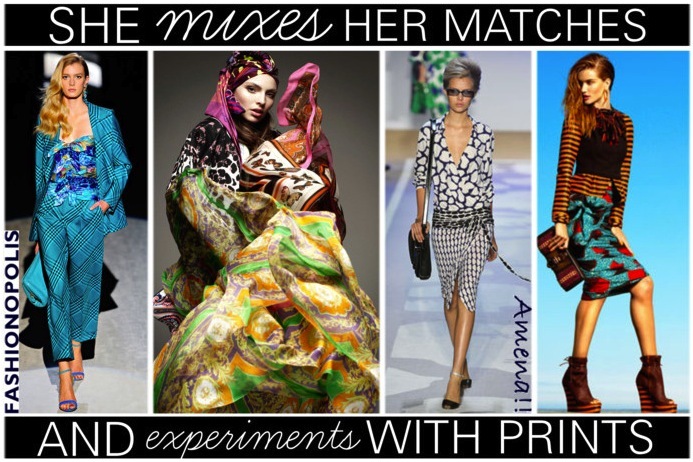 So, are you all set to join the print mixing bandwagon? And how would you like to experiment with this trend? Share your paring combination and styling options with me in the comment section. This is such a great post!! Out of my comfort zone but there are so many great patterns out there this season, I have been venturing out. Love it! Thank you Andee. In all honesty print mix is out of my comfort zone too, but I do love this trend and willing to try some out myself. Thank you Sonshu. I too love the bag in the third one. Very nice styling!! I think if done correctly, mixing pattern can be so beautiful and so impactful!! Hope you are having a wonderful day! Thank you Jyoti. Your comments mean a lot to me. u have a cool blog, followin rite now! Thank you. Yes I too am following you. A great post! The dresses are beautiful! Such a great post....awesum. I like floral and geometrical prints for this season. I could be counted as the biggest fan of prints. I love combining bold prints with small prints. I have also tried graphic prints with linear prints and it has looked amazing on me. A great read this blog is.